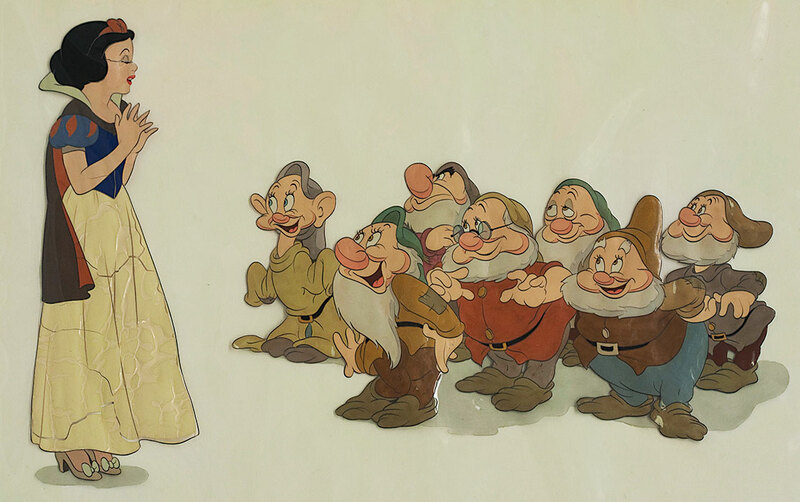 An animation cel from the 1937 film Snow White and the Seven Dwarfs. Photo: © Disney Enterprises, Inc. The Walt Disney Animation Research Library (ARL) and the Getty Conservation Institute (GCI) announced the second phase of their ongoing collaborative research into the conservation of Disney animation cels. Over the course of this four-year-long phase, scientists and conservators from the GCI and ARL will investigate optimal storage conditions for cels, as well as strategies for reattaching flaked and delaminated paints to the plastic surface. The continued research is made possible by a generous contribution from the Walt Disney Company. The ARL and GCI began their collaboration in 2009, when the ARL provided the GCI with access to over two hundred thousand cels from the 1920s to late 1980s housed in their climate-controlled facility. GCI researchers analyzed and differentiated three types of plastic used to produce animation cels—cellulose nitrate, cellulose acetate, and Mylar (polyester). They also assessed the condition of sample cels, observing yellowing, warping, cracking, shrinking, and delamination of paint. To determine optimum storage conditions for cels—the most important factor in the overall strategy for preserving the collection—GCI researchers will investigate parameters such as mechanical behavior, moisture uptake, and rate of chemical degradation. While there is much research regarding best storage conditions for plastics, the storage conditions developed for this project will be tested on painted cels, cel plastics, and paints. This research will be aided by the ARL’s well-documented collection of animation cels and paint formula information, which spans many decades. To explore reattachment of paint to the cels, various minimally invasive procedures explored in phase one will continue to be evaluated, and best practices will be established for future conservation work. The research will be performed by both GCI researchers and researchers from partner institutions. The spirit of cooperation and the lending of expertise undertaken as part of this collaboration can serve as a model for future partnerships in plastics conservation. The ARL-GCI effort is at the center of the Preservation of Plastics project, one of the key components of the GCI’s Modern and Contemporary Art Research Initiative.